I know there are many sins committed in the name of the great BFG. 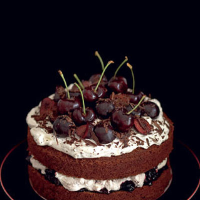 But properly made, it’s the taste of the cherry orchard in high summer – with whipped cream. Preheat the oven to 180°C/gas 4. Line the base of a 20cm cake tin with greased baking parchment. Beat the butter in a warmed mixing bowl with the sugar until light, pale and fluffy. Beat in the yolks one at a time. Sieve the flour, cocoa powder and coffee onto a plate. In a separate bowl, whisk the egg whites to soft peaks. Fold the whites and the flour mixture gently into the butter mixture in alternate spoonfuls. Pour into the tin; bake for 45 minutes until the sides have shrunk away from the tin. (If using a fan oven, turn down to 170°C/gas 3 after 30 minutes). Cool for 5 minutes, then turn out onto a rack. Make a syrup by dissolving the sugar with 2 tbsp boiling water in a pan. Take off the heat and add the kirsch. Whisk the cream into peaks; mix in the icing sugar halfway through. Chop 200g cherries; fold into half the cream. Slice the cooled cake in two. Place one half crumb-side upwards and trickle over half the kirsch syrup. Spread over the jam and cover with the cherry-cream mixture. Put the other cake half on top and drizzle with the remaining syrup. Spread the plain cream mixture over and pile the rest of the cherries on top, including those with stalks. Sprinkle over the chocolate.